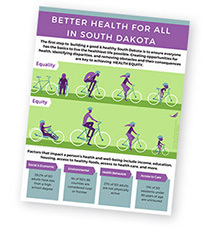 As part of the 2015-2020 Strategic Plan, the South Dakota Department of Health has developed this webpage to provide a central location for cultural competency training and resources for its employees in order to promote a culture of organizational excellence (Goal 5, Strategy B). Click here for a list of definitions related to health equity and cultural competency. Organizations can engage in practices that influence their impact on health equity. Practices such as staff training, resource distribution, and staffing decisions impact public health. Involve community members in health initiatives to foster relationships, improve assessment efforts, build capacity to positively affect the community, and enhance sustainability. Engage a diverse sector of partners to collectively achieve equitable outcomes by leveraging diverse skills and expertise. Understand inequities that exist to establish baselines, monitor trends over time, inform partners where to focus resources, and ensure strategies address the needs of populations experiencing health inequities. Ensure strategies have a deliberate focus on health equity and include supportive activities to address barriers or unintended outcomes underserved populations may face. Focus on health equity in evaluation efforts and use culturally appropriate tools and methodologies. Health equity oriented evaluation can reveal trends in health inequities. This course is about 2-4 hours in length and includes content and instructions that can be modified according to organizational needs. This health equity toolkit has been created by the Institutional Equity Committee, a subgroup of the NACDD Health Equity Council, to help identify biased practices and policies. It is being piloted in 9 states. The Roots of Health Inequity is an online learning collaborative. The site offers a starting place for those who want to address systemic differences in health and wellness that are actionable, unfair, and unjust. As a participant in the learning collaborative you will have a chance to explore concepts and strategies by working through five critical questions. Increase knowledge and inform the practices of local health departments and their multi-sector partners on health equity and social justice principles, key concepts, and applications. Assessing the attitudes, policies, practices, and structures of service organizations is a necessary and effective way to plan for and include cultural competency in an organization. Completing self-assessments offers many benefits to organizations including monitoring how effectively they are addressing the needs and preferences of culturally/linguistically diverse groups, improving family/client utilization of services, and increasing family/client satisfaction with the services they receive.